So a customer loved your email subject line. Awesome! But you’re only getting started. Like anyone who has set a goal to exercise more knows, getting a gym membership is just the first step. You have to actually go. And in email marketing, a customer has to actually click. For some inspiration, I highlighted some of the top emails I have received lately. Consider these email body tips your free personal consultation. Subject line: Details, please! Did you like your purchase? 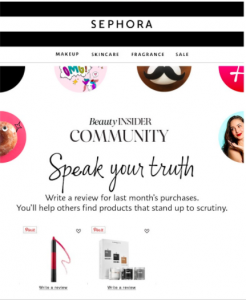 What works: Sephora’s emails aim to be personal, like you are chatting with a friend. From the conversational tone of the subject line to the very empowering “Speak your truth” in the body copy, this email is designed to get the recipient to open up and share their thoughts on their latest purchases. At Persado, we recognize that emotionally-charged language drives higher engagement. In this message there are several examples of Encouragement, which we define as language that inspires someone to take an action by explicitly prompting them to do something. It highlights the benefit of providing a review – letting other beauty-lovers know what is to die for and what they should avoid. What could be improved: The calls to action are very small. It would be better to make the product images slightly larger to increase the text real estate available to have a more powerful CTA. What works: Every Sunday, Furthermore sends out workouts curated by top Equinox trainers to prepare the subscriber for the week ahead along with strategic tips and scientific explanations of the movements. There is a lot of information packed in these emails, but what makes them especially effective is the use of animation. Even if I don’t click through to the article, I can see the movements in the leading content block and get inspired. The content is clear, easy to read, and the calls to action are tailored to each article. Emotionally, the email evokes Fascination (“Get inspired”), Excitement (“The Best Way to Start the Week”) and Encouragement (“Kick-Start Monday). What can be improved: Not much! Subject line: Last chance, get your great finds before they are gone! What works: The sense of urgency (which could be false!) 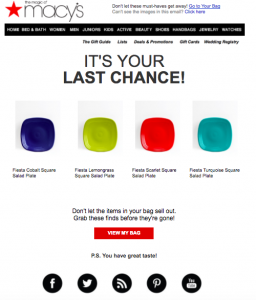 is compelling – the email utilizes the emotion of fear to entice their cart abandoners that the items may sell out soon. The call to action is also made more personal by referring to “My bag” rather than a generic bag or cart. Our data shows that including first-person phrases in CTAs (“See My Deals” or “Take Me Away”) consistently outperform less personal phrases. The real clincher is the appended “P.S. You have great taste!” – it’s a nice piece of flattery (which we’d categorize as the emotion of Gratitude) that reaffirms you’ve made a good choice and really should complete that purchase! What could be improved: Note that I mention the false sense of urgency – I think this could just be a ploy to get me to come back and buy. Either back it up with numbers and mention there are only three plates left, or try different emotions, since we know Urgency is one of the worst emotions to use in retail marketing. What works: Lush is well-known for their handmade, eco-friendly, socially conscious products and is constantly innovating – this time by super-sizing a popular product. What is great about this email is that it’s very clear – it tells you what the product is (Giant Rose Bombshell), why you’ll like it (it’s got rose petals in it), where you can buy it (online and in stores), and when (January 19). Additionally, it has a pleasing monochromatic palette, from the model’s shirt to the background to the products themselves. This email also included animation so you can easily see how much larger this new bath bomb is. The content focuses on the product description but uses the emotional concept of Fascination (“Introducing”) which we have seen be very effective in editorial emails. The email further acknowledges that the brand listens to customer response (“You loved Giant Golden Wonder so much…”). The CTA is personal, to the point and much more impactful than the very tired “Buy Now” button. What could be improved: This email is pretty spot on! Subject line: Supply and demand…simple, right? What works: From top to bottom, there is some good marketing going on! It’s nice to be reminded that shipping is free (when you spend enough). 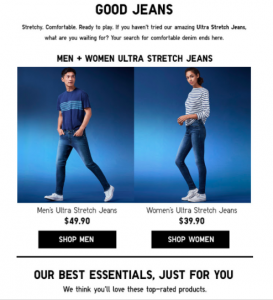 The headline is catchy even though it’s a pun and the product description tells you exactly why these jeans are superior over the jeans in the next email in your inbox. Bonus points for clearly directing users to either men’s or women’s shops rather than a generic landing page – you need to think about the easiest way to get a user to the next step, not put barriers in their way. Below the fold are some top-rated recommendations that include user-written reviews which intend to add some credibility to why the products are suggested to you. Kat Dessenon is the VP of Campaign Management, North America. 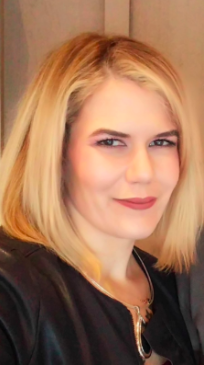 Over the past seven years, she has designed thousands of marketing experiments in nine languages for Persado’s clients and now leads a team of 17 to deliver compelling, on-brand content to increase customer engagement. She firmly believes in the power of testing to improve performance. Her past work has taken her all over the United States and beyond—from San Francisco, CA to Athens, Greece—and she now resides in New York City where she spends equal time in the gym and scrolling through the Gmail’s Promotions tab for inspiration (sometimes simultaneously). She holds a BA in English from Douglass College.